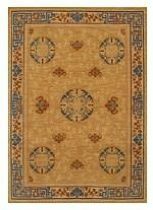 The pattern of our Mandarin rug was inspired by an antique Chinese carpet of exceptional beauty. A palette of saffron yellow, cinnabar, and porcelain blues makes a fresh statement that works with both classic and contemporary interiors. More than just beautiful, our Mandarin rug is loaded with auspicious symbolism. In the field are stylized Ôbat' motifs Ð a symbol of good fortune, luck, and happiness; and the ÒshouÓ symbol in the medallion centers represents longevity. The colors have meaning as well. Yellows along with our cinnabar and reddish brown are ÒearthÓ colors and make a perfect choice for living rooms or any room that is the hub of the house.